I remember forwards. I remember forwards, and forget backwards. My memories, bad, boring, or good, haven’t happened yet. So I will remember standing in the fresh-cut grass with the black-clad figures surrounded by stone until I do it for real. I will remember the funeral until it happens – until someone dies. And after that, it will be forgotten. Here’s the thing about me: I can see my future, but my past is blank. I see the future in flashes, like memories. I remember what I’ll wear tomorrow, and a car crash that won’t happen till this afternoon. But yesterday has evaporated from my mind – just like the boy I love. I can’t see him in my future. I can’t remember him from my past. But today, I love him. And I never want to forget how much. When I first read the blurb of Forgotten I thought it would have a strong Speculative Fiction tone. However, it reads like a contemporary novel – London has become accustomed to knowing the future and forgetting the past and the story is a lot smoother than I imagined. In fact, this story has no obvious inconsistencies and flows very well. It’s always difficult for an author to explore a new idea thoroughly, but Cat Patrick has achieved such a high level of detail in this book that I was surprised to learn that it is her debut. I haven’t read many characters like London in young adult literature. She’s very much in the background of her school – never drawing attention to herself and just getting through each day while keeping up appearances. Her best friend is the gorgeous popular girl at school, who knows her secret but takes London for granted. But London isn’t a pushover, doesn’t have self esteem issues and never hesistates to stand up to her best friend. In fact, she’s awesome! I love her character and wish more young adult heroines were like her. The romance in the book took me by surprise because London is instantly obsessed with Luke (and then forgets all about him the next day!) but the development of their relationship is slow and sweet. Actually, parts of their interactions remind me of the movie 50 First Dates, and they were hilarious! I also found London’s bond with her mother gratifying to read – they get along really well and support one another. 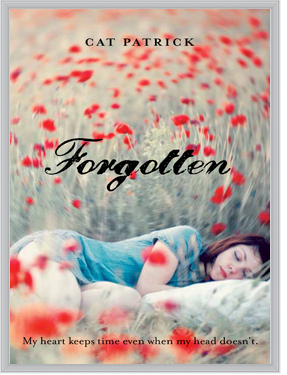 Forgotten is well written and beautifully imagined, with deep characters and a fresh premise. I was pleasantly surprised by it, and now I’m even more eager to read Cat Patrick’s newest title, Revived.